Fuccillo In The Community Near Albany, NY | Fuccillo Lincoln, Inc.
On August 19th, 2018, we held one of our Huge Fuccillo Family Community Outreach events, where our General Manager, William Granata, and Sales Managers, Terry & Nick, visited a local gas station for our Huge Gas Giveaway! We take every opportunity we can to give back to our community - where will we end up next? On December 18th, 2017, Fuccillo Hyundai of Schenectady, Fuccillo Volkswagen, and Fuccillo Nissan of Latham donated 358lbs of hams and non-perishable foods to the local food bank! Here at Fuccillo we love giving back to the community in anyway we can, especially during the holiday season. Fuccillo gives back to the local community at the Ronald McDonald house four times a year. 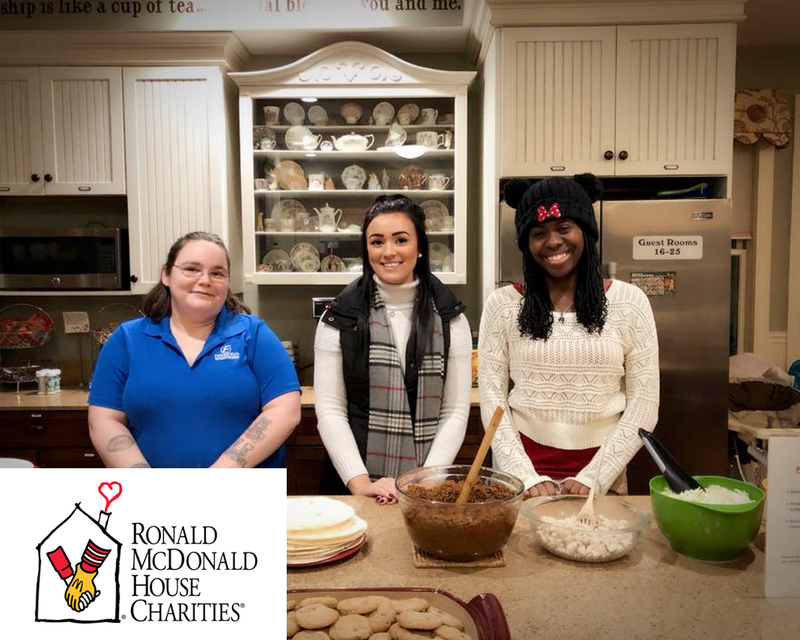 On January 24th, 2018, we cooked a meal for the families staying at the Ronald McDonald House Charities of the Capital Region. We prepared a beef and chicken taco bar and made chocolate chip and sugar cookies for dessert! We were also shown the new movie theater that was recently added in - so awesome! On September 26, 2016, we were excited to prepare a meal for 50 people. We served chicken penne alla vodka, chicken penne alfredo, broccoli, bread, and baked chocolate chip and sugar cookies. We checked out the house, and were: the open room where a family would stay, the game rooms, the libraries, but most importantly, we were able to meet and hear the stories of the families staying at the house. 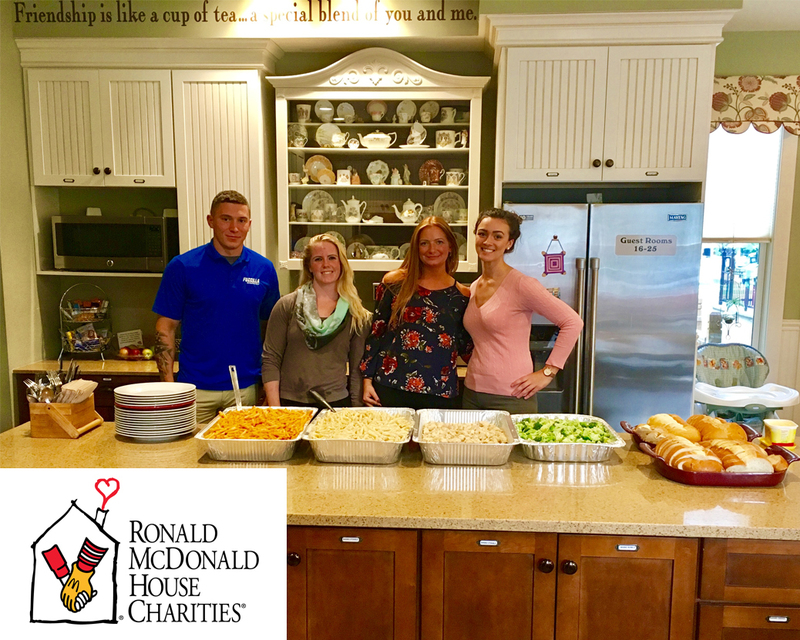 The Ronald McDonald house really makes it feel like home for these families who are going through such a hard time. Our team is so grateful to be able to volunteer and be a part of such a great cause. In 2015 Fuccillo Automotive Group increased their donation to the Vera House by 25%! With a total of $59,400 raised from the dealerships across central NY, Fuccillo was able to make a HUGE donation for a great cause. Click HERE to read the full article by the Vera House. 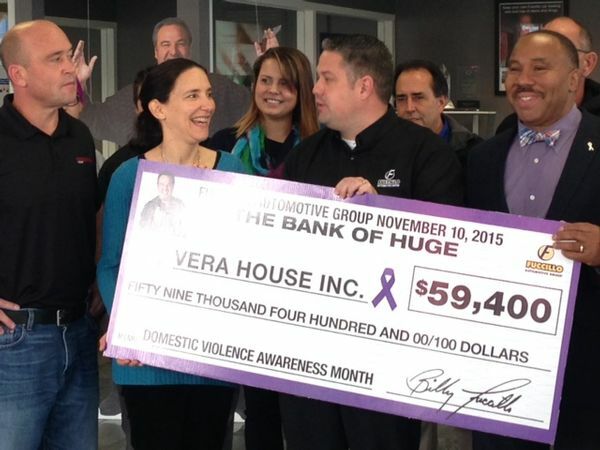 Billy Fuccillo donates $44,300 to Vera House resulting from his October domestic violence awareness promotion. A $100 donation was made to Vera House for each car sold or leased from Fuccillo Kia of Clay, Fuccillo Hyundai of Syracuse or Fuccillo Nissan of Clay. 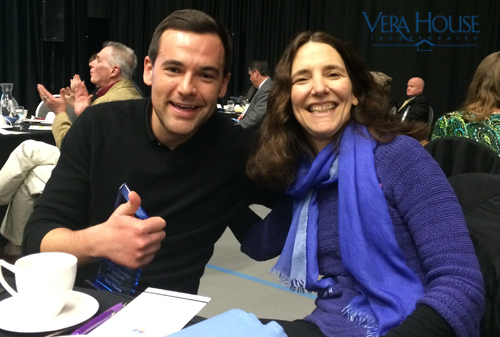 Billy Fuccillo Jr. was proudly recognized at the BizEventz Nonprofit Awards on March 31st, 2015 for Fuccillo Automotive Group's donation in conjunction with National Domestic Violence Awareness Month. To read the full article posted by Vera House click HERE. To learn more about the Vera House, visit their website at VeraHouse.org. On May 11, 2013, The Fuccillo Nissan team took on the Wounded Warriors Amputee Softball Team at NBT Stadium where the Syracuse Chief's play! The game took place on Armed Forces Weekend at the ballpark, and Billy Junior donated $10,000.00 to the Wounded Warrior Project in sponsoring his team of local athletes and local celebrities like meteorologist Chris Brandolino. Billy and his team played a hard game, but the Wounded Warrior Amputee Softball Team creamed them 30-8, in a game that was a lot of fun for everyone involved. To get involved with the Wounded Warrior team or project, see their website, at www.woundedwarrioramputeesoftballteam.org. The Assumption Food Pantry on Syracuse's North Side may notbe able to continue helping the hundreds of families it serves. The pantry needs thousands of dollars so it doesn't have to close at the end of the year. Billy Fuccillo and his son Billy Fuccillo Jr. were touched by the story and they decided to donate up to $50,000. They are urging Central New Yorkers to give and will match donations up to that amount. CNY Central is partnering with the Fuccillos to help raise money and awareness for the Assumption Food Pantry. The Assumption Food Pantry is located on North Salina Street in Syracuse. Just three years ago, 135 families were registered to receive food each month but has grown to now serve 900 families. If the pantry can't stay open, all 900 families would be without the help they rely on. Fuccillo is asking people to donatewhatever they can, whether it's a donation of $1, $2 or $5. He says everyone is entitled to food and this story really compelled him and his son to step up. "It's really important for us to be involved in the community and give back because they give so much to us," Fuccillo said. In the month of October, Billy Fuccillo Jr. donated $27,000.00 to the Susan G. Komen Foundation for Breast Cancer, including a $100 donation for every car sold during Breast Cancer Awareness Month. The Komen Foundation fuels the best science and makes the biggest impact in the fight against breast cancer. Thanks to events like the Komen Race for the Cure, the Foundation has invested almost $2 billion to fulfill their promise, working to end breast cancer in the U.S. and throughout the world through ground-breaking research, community health outreach, advocacy and programs in more than 50 countries. To join their fight, visit the Foundation at www.komen.org. Billy Jr. has recently donated $1,000.00 to the Baldwinsville Varsity Cheerleading squad for their big Competition trip! If you would like to help the team out, you can contact Coach Capri Glynn at 440-5988, or via EMail at cglynn09@elmira.edu.